The standard 350 c.f.m. exhaust fan, included in the upper cabinet of your range, is factory-set to recirculate air through a charcoal filter. It can also be used to outside-vent exhaust if there is not more than one 90 degree elbow or more than ten feet between the range and the outside wall. This fan exhausts air only from the back of the range cabinet – it cannot be adapted for top-venting. 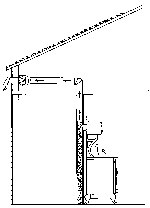 Height from floor to center of duct opening is 62 5/8″ (60 5/8″ for short leg models). From left base cabinet countertop overhang to center of duct opening is 15 3/8″. If you are outside-venting your range with more than 10 feet of ducting, or more than one elbow… or if you simply prefer a more powerful exhaust system … you should include the optional 636 c.f.m. in-line exhaust blower. The #1518 In-Line Blower exhausts smoke and cooking odors quickly and quietly, exiting the house up to 35 feet from the range. If desired, the blower can be mounted in the basement or attic for powerful, whisper-quiet operation. The blower can be mounted vertically, horizontally or at any angle. Backward-curved airfoil blades move maximum air with minimal sound. Fan and motor are precision balanced for quiet vibration-free operation. Blower wiring attaches to the junction box on the back of your range. The in-line blower and ducting can be mounted to or between (allowing for 14″ blower diameter) structural joists. Alternate installation: The exhaust duct can extend straight up through the roof (see below). This method will require a roof flashing and cap, not included. The exhaust duct runs down the wall behind the range into the basement, where it exits through the foundation wall. The in-line blower and ducting can be mounted to or between (allowing for 14″ blower diameter) structural joists. Log homes and homes with a cathedral ceiling often require a top-ducted exhaust. Advise your dealer if you are using this application – a 7″ round hole must be made in the top center of your range cabinet. We highly recommend locating your range in the kitchen prior to cutting the hole in the roof. (Ducting can also be routed through kitchen cabinets above range, if desired.) 7″ duct pipe, 7″ to 8″ increaser, roof cap and roof flashing not included. Adapter elbow – attaches to back of range, converts range outlet to 3-1/4″ X 10″ standard duct size. Back draft damper with spring return – prevents cold air from entering house when blower is not in use. Outside louver grill – covers the exhaust outlet at soffit or foundation wall. Louvers automatically close when the blower is not in use. Duct extender – mounts to back of range cabinet, replacing deflector plate. Duct pipe, roof flashing and roof cap (if required) are not included. 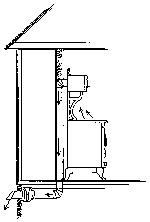 There are two options for venting an Antique range directly through an outside wall behind the range: using the standard exhaust fan located in the upper cabinet, or using the optional Model 1519 wall-mounted exhaust fan which mounts on the outside of the wall behind the stove (see below for details). For extra power, a 485 CFM Model 1519 wall-mounted exhaust fan can be installed on the outdoors side of the wall, exhausting through the wall directly behind the range. The 3-¼” x 10″ duct from the back of the range must transition to 6″ round to connect to the external blower. The Model 1519 blower replaces the standard exhaust fan provided in your range cabinet, and must be ordered when you order your range.